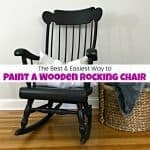 Painting a rocking chair and not sure the easiest way to go about it? No worries, I’ve got you covered. 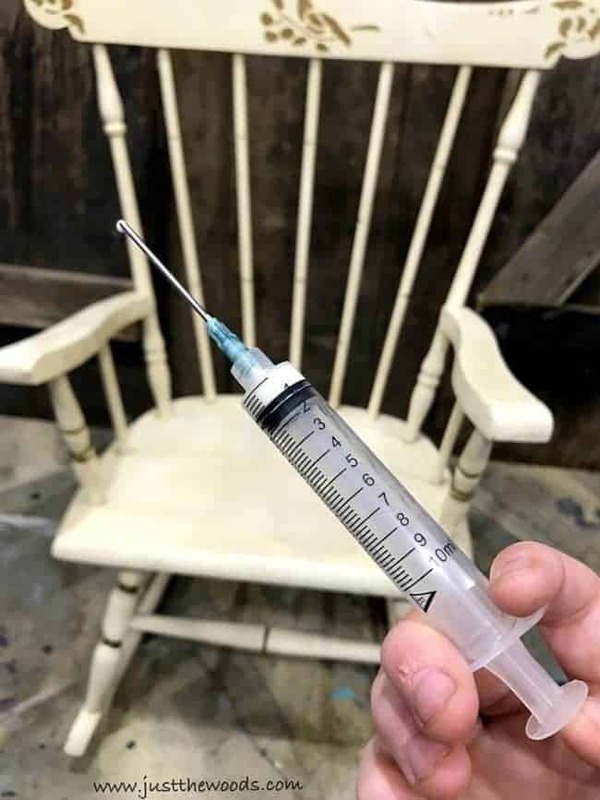 When you are planning to paint a vintage rocking chair with spindles, does the thought of painting spindles make you twitch? Just thinking of getting an even paint finish around those super skinny spindles is enough to drive someone mad. But it doesn’t have to. This must be the main reason that paint sprayers were invented in the first place ;). None of these issues are bad enough to send the rocker to the trash. Let’s get this cutie ready for a birthday party! 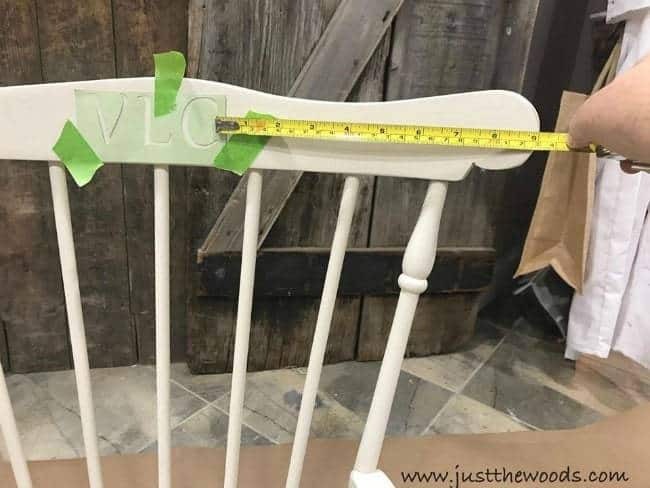 Before painting the rocking chair the damage and loose spindles need to be re-secured. 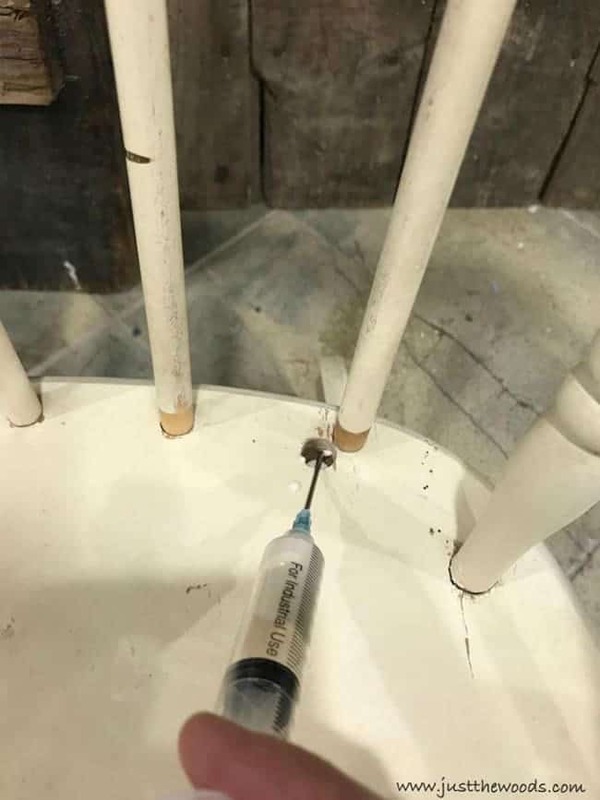 The best way to get wood glue into a small space with minimal mess is with a wood glue syringe. Squeeze wood glue into the necessary areas and press the spindles back into place. 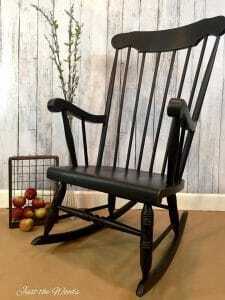 The vintage rocking chair is then prepped the same way that I always prep painted furniture. 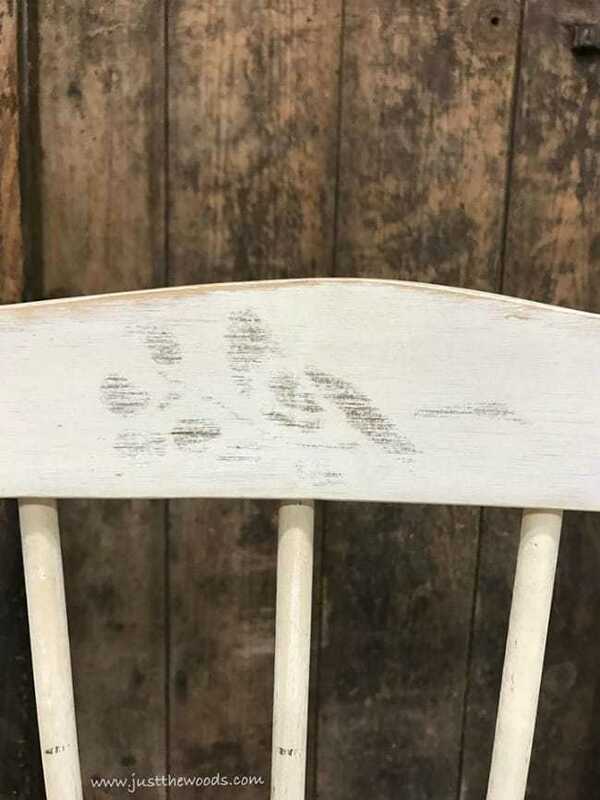 A thorough cleaning and sanding will prepare the chair, but I can still see remnants of the old gold details. 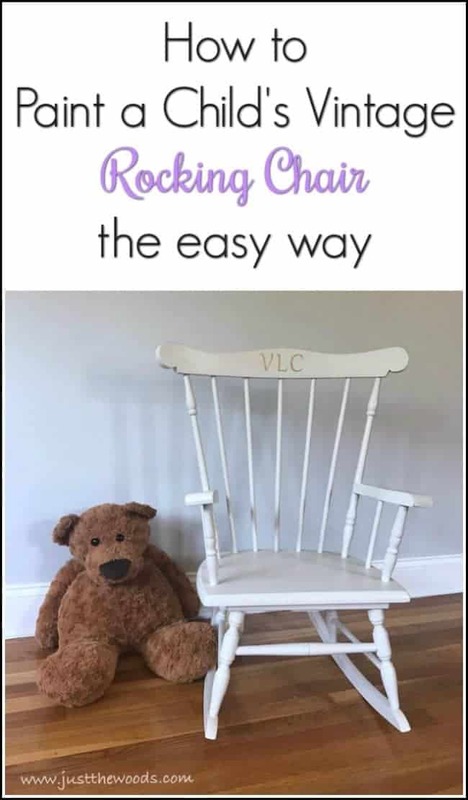 Click here for more painted rocking chair makeovers: Rocking chairs. 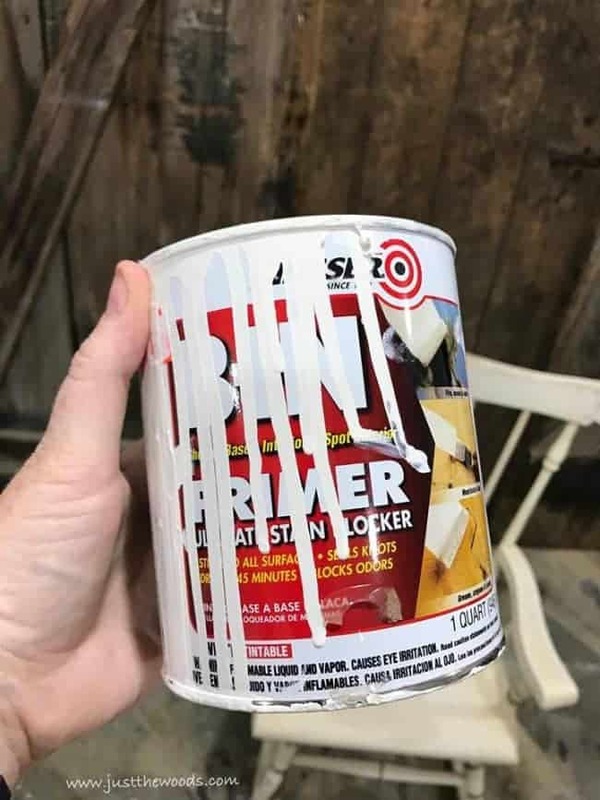 In addition to the standard prep process, I’m adding a primer due to the fact that the new paint finish will be off-white. 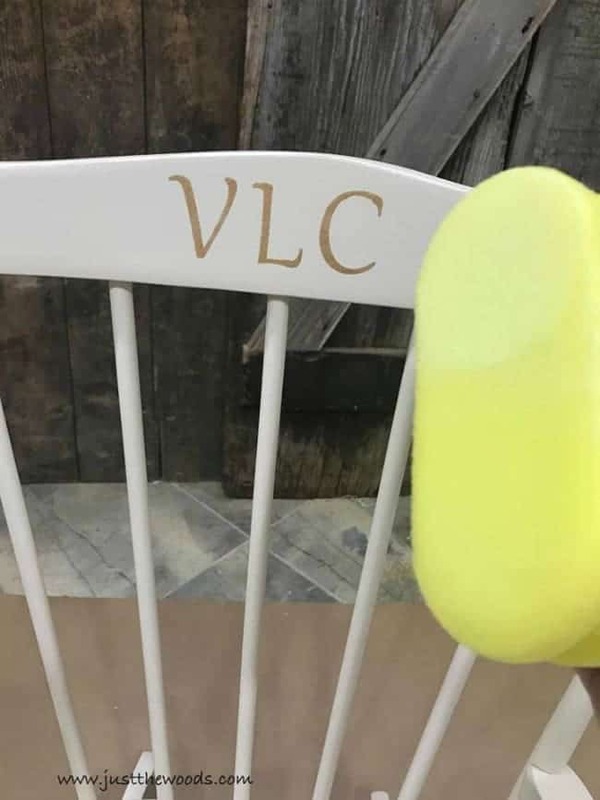 Once the chair is sanded, cleaned and primed we can get moving with paint. 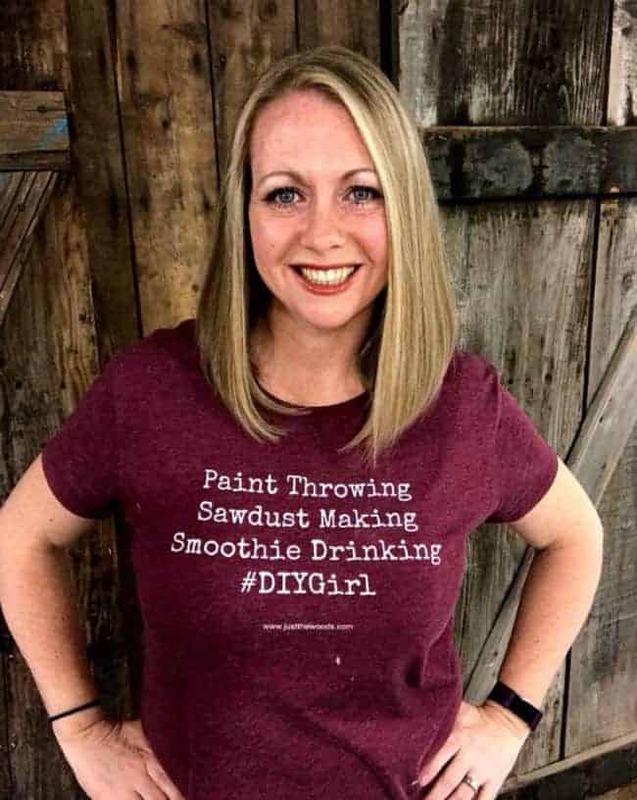 Throw up a tarp/ drop cloth and grab your paint. 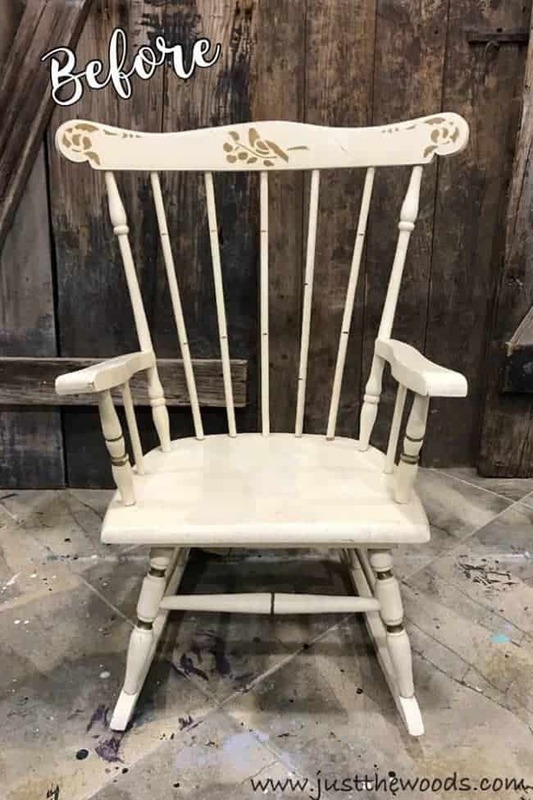 This vintage rocker is being painted in a creamy off-white furniture paint. You can find great quality furniture paint online HERE. 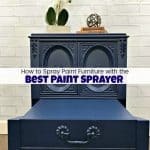 An added bonus, when painting furniture, especially when it comes to painting children’s furniture, you want to make sure to use quality non-toxic furniture paint. 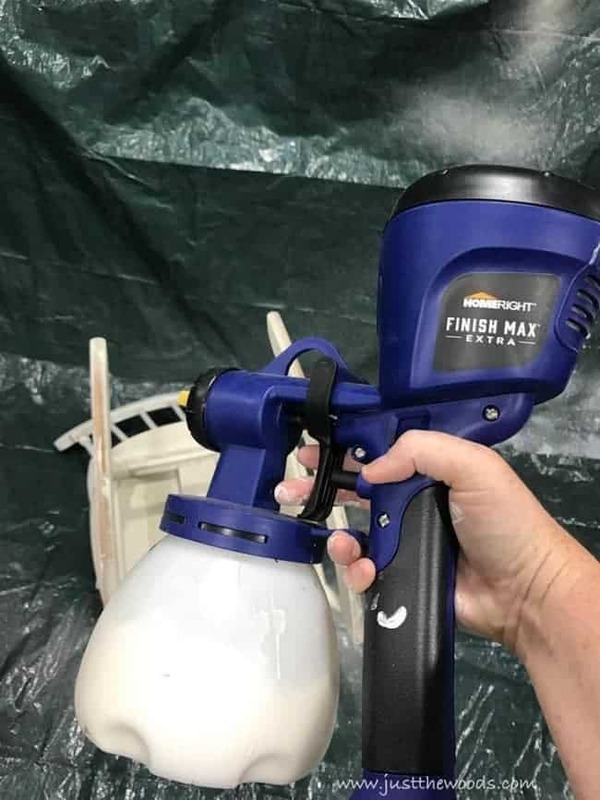 Also, grab your HomeRight Finish Max Super paint sprayer, because this will make you hate spindles just a little bit less. 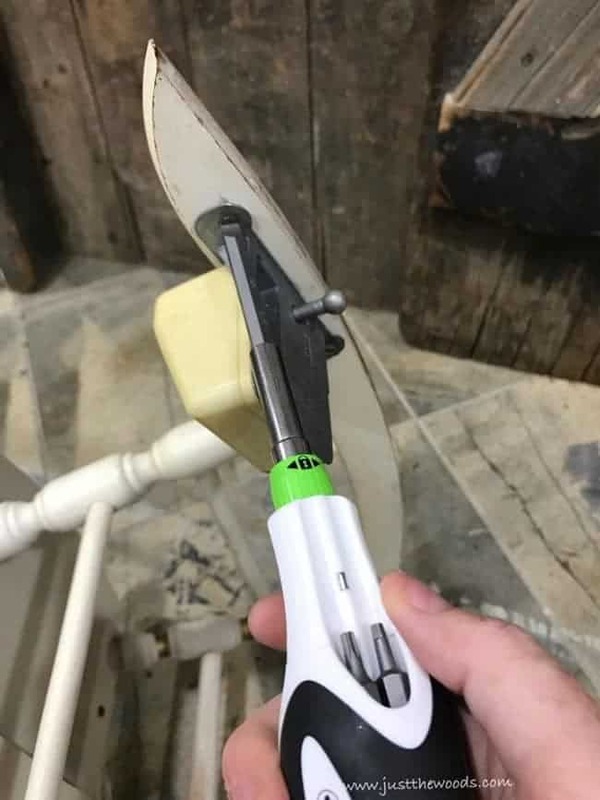 Flip the rocking chair over and spray the underside first. 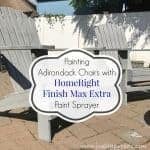 Using the HomeRight Finish Max extra paint sprayer makes it easy to spray from above and below and any necessary angle. I feel like Wyatt Earp when I spray because I have a little more fun than maybe I should. 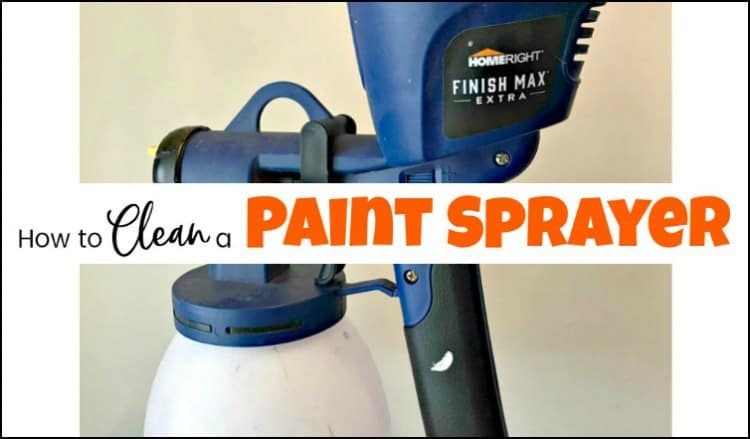 Click here for more paint sprayer projects and tutorials: Paint Sprayer. 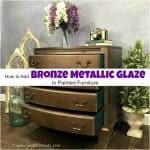 See this paint sprayer in action when it adds a metallic glaze to a painted dresser here: Metallic painted dresser. 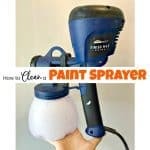 If you are unsure of how to clean your paint sprayer when done then make sure to check out How to Clean a Paint Sprayer. For a super soft finish make sure to lightly sand in between each coat. Then wipe away with a clean lint-free cloth to keep it clean. 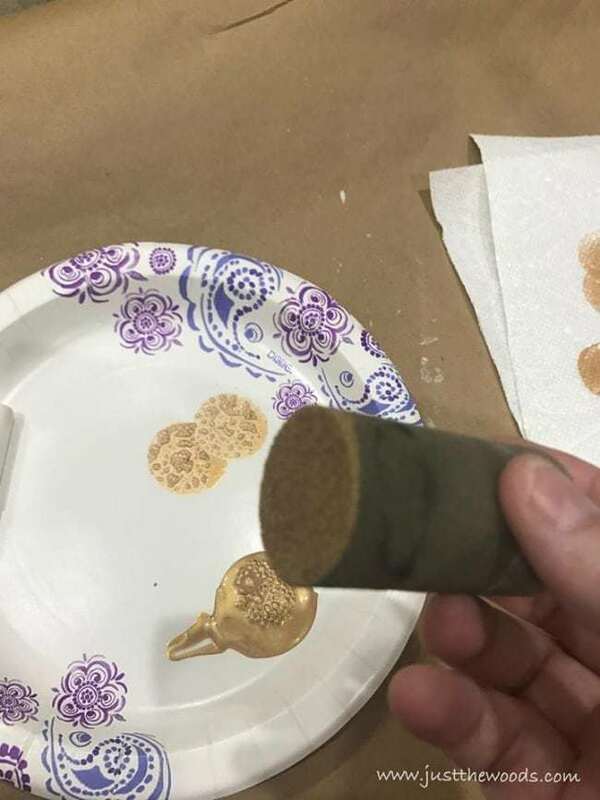 I lightly sand in between both coats of primer, as well as both coats of paint, using added pressure to the edges for a distressed look. 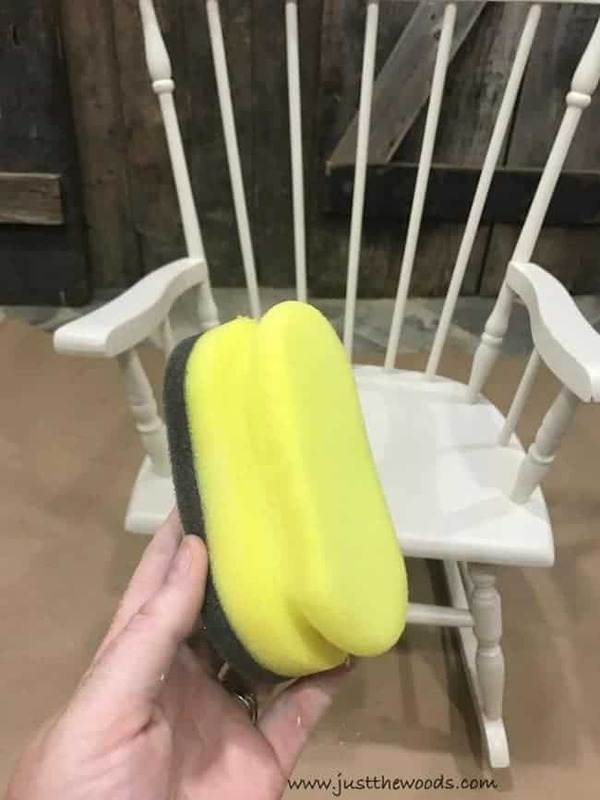 After two coats, the painted rocking chair is sealed using a clear protective sealer. 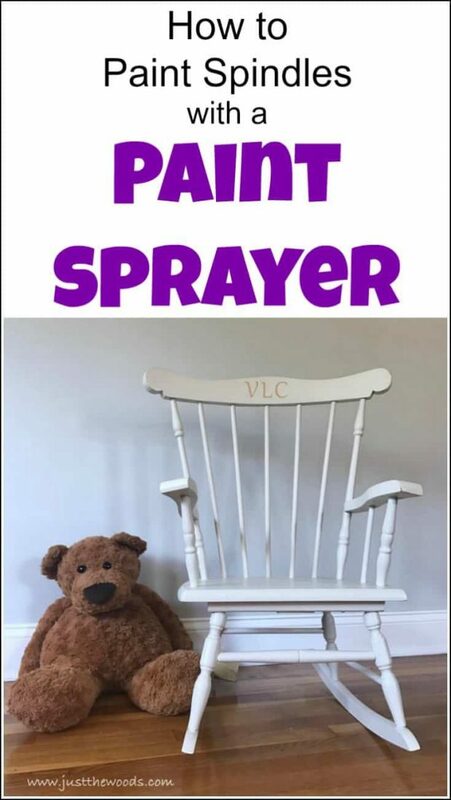 When it comes to using sealer on a rocking chair, you can use the paint sprayer. But in this case, I’m going a different route. 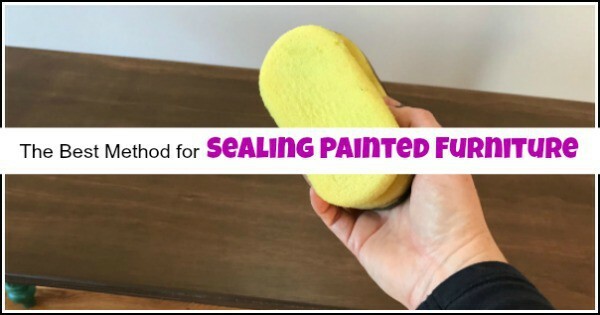 This yellow detailer sponge works perfectly for adding a clear sealer. Its flexibility makes it easy to wrap around the spindles and get into any small areas. 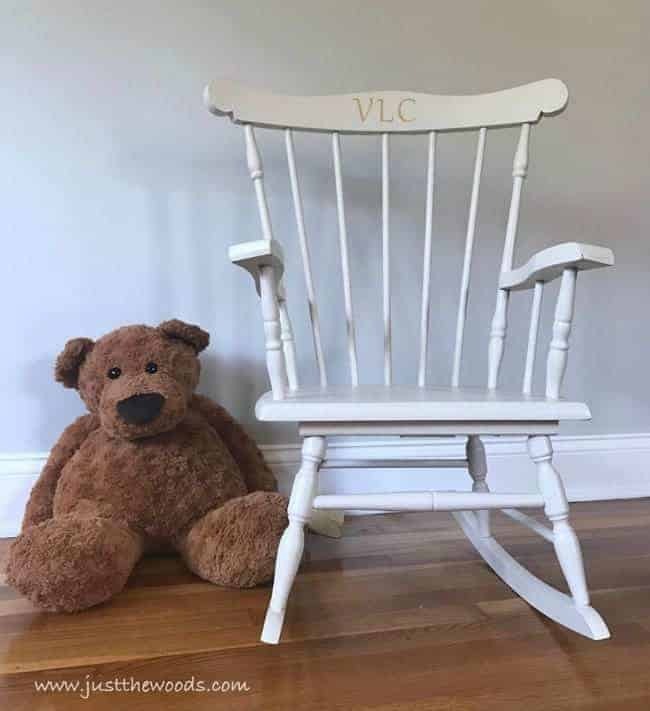 We are adding a personalized touch to this child’s rocking chair. Simple initials in soft metallic gold. 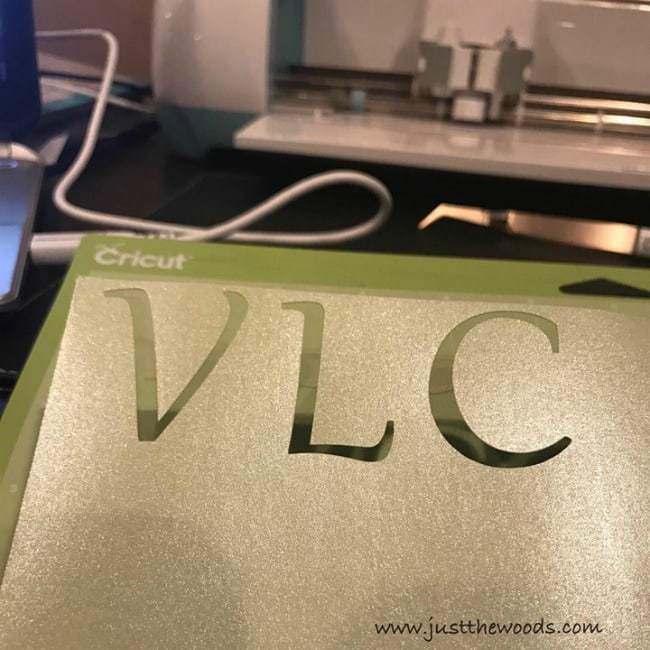 To create a personalized stencil you can grab your Cricut Machine (I have the Explore Air). Grab your custom personalized stencil and your gold paint. 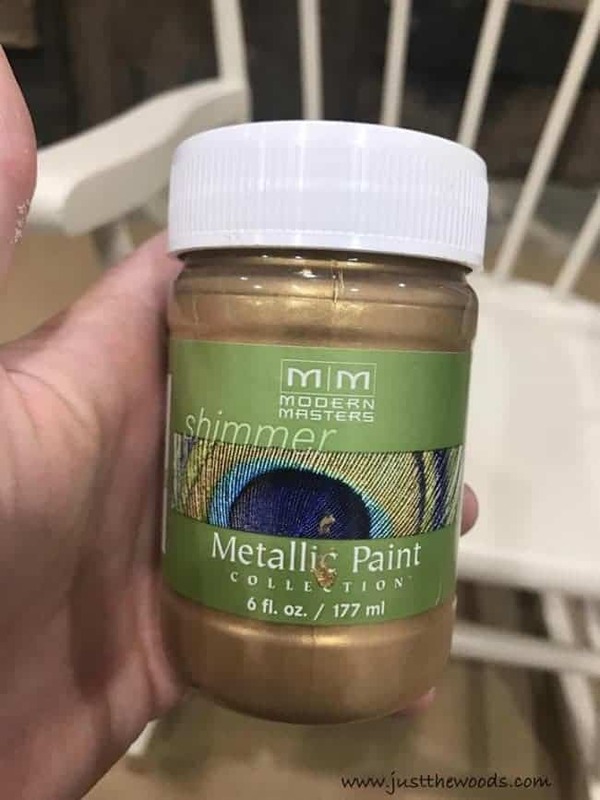 This is done using Modern Masters gold metallic paint. 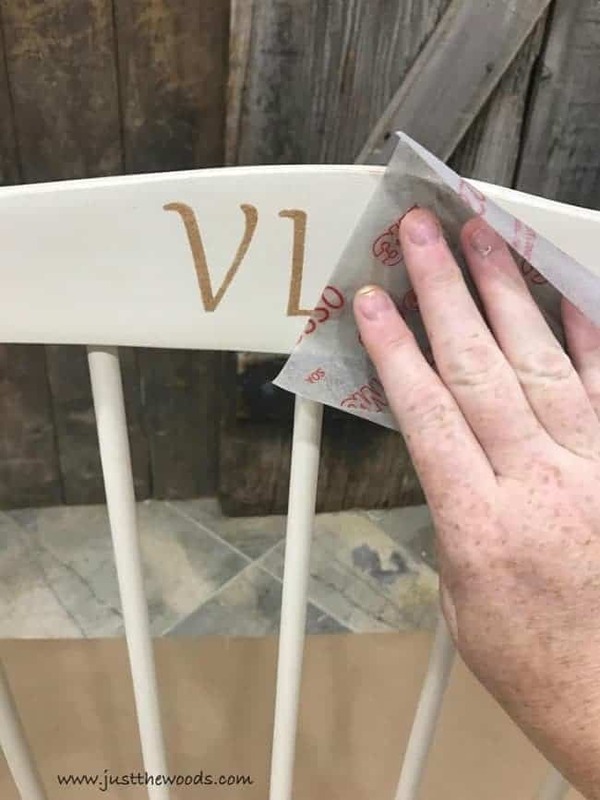 Trim your stencil and tape it in place on the rocking chair. Next, make sure to measure your placement so that it is centered. 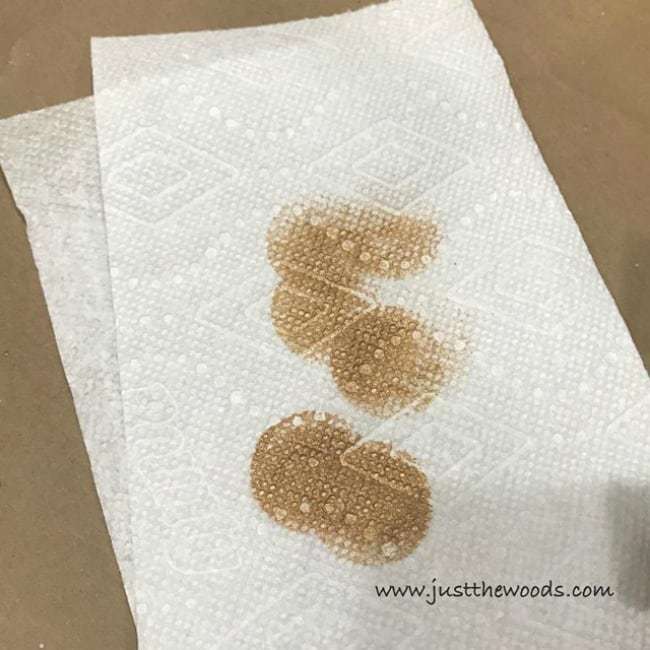 Make sure to use only a tiny bit of paint at a time by dabbing it off onto a paper towel first. Using too much paint will cause the paint to seep under the stencil and look messy. Your foam dabber should feel like it barely has any paint on it at all. You can apply a few times this way. 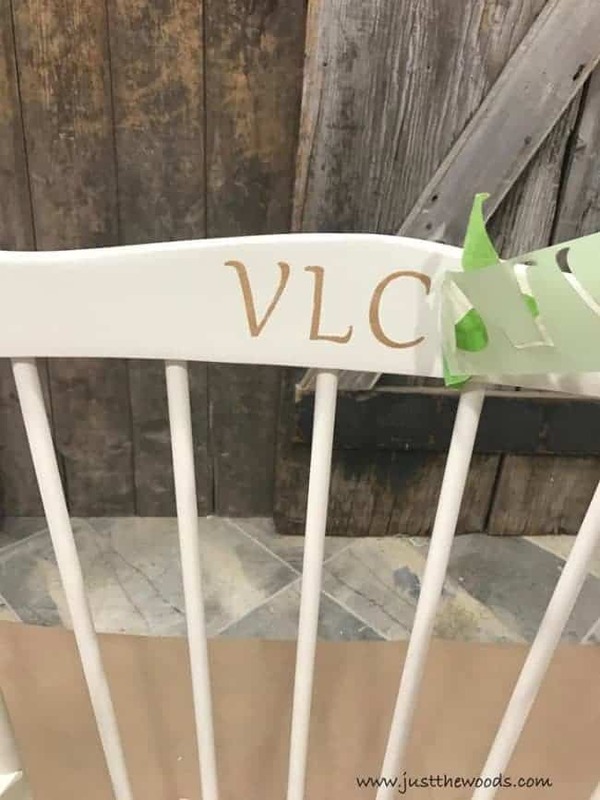 Once you’re finished go ahead and remove the stencil from the painted rocking chair. Next, lightly sand over your stencil to remove any raised edges. 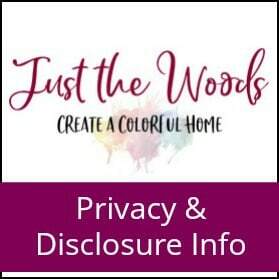 Don’t forget to apply clear sealer over your painted stencil. And re-attach the music box! 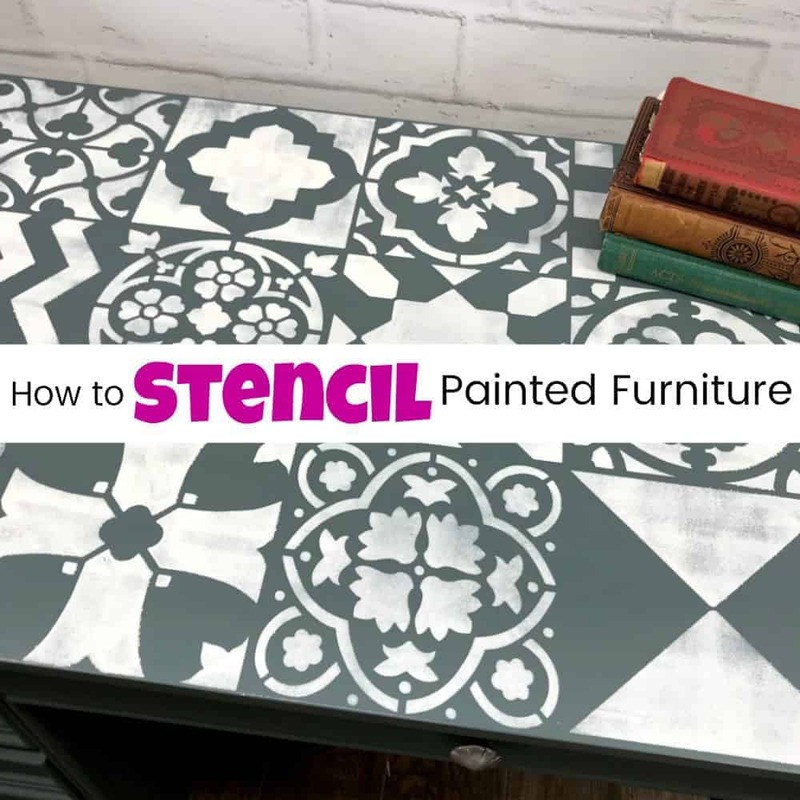 For a more detailed tutorial on adding stencils to your painted furniture makeovers make sure to check out How to Stencil Painted Furniture. There’s even a video included in the post. That was a lot painless than using a paintbrush, wasn’t it? 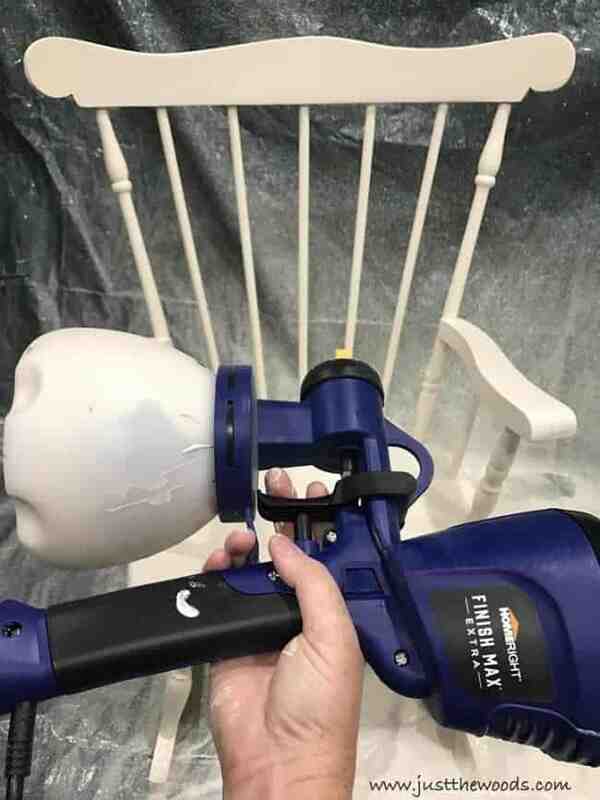 When painting a rocking chair with spindles using a paint sprayer is the way to go. 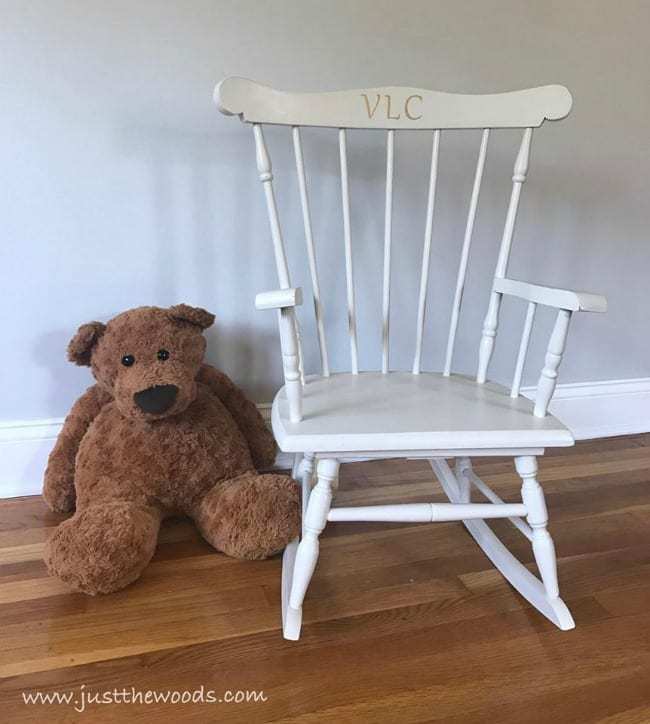 This sweet rocking chair is ready for a special little girls first birthday! 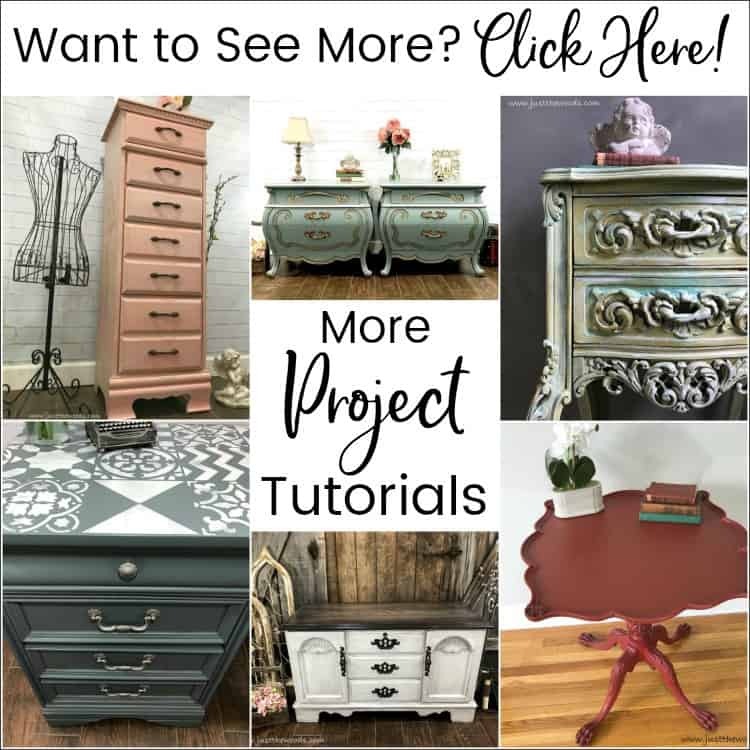 If you are feeling overwhelmed or just starting out you can always start at the beginning with How to Paint Furniture – a Beginners Guide. You take of you! That skin cancer is nothing but serious business. A friend of ours is fighting for his life right now and we have already buried another, 32 year old father of 4, youngest being 4 months old. Please please take care of you. Prayers for clear margins and speedy recovery. thank you so much! and thanks for the netflix suggestions I will def have to check those out!